There has never been a time within our human history in which we have had so much assistance for us to completely disengage from an obsolete and manipulative reality. 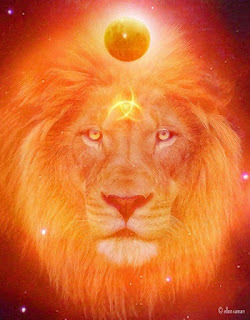 It is precisely at this time, when our Planet is experiencing a massive awakening that we welcome a very powerful Eclipse at the special 00°51 degrees Leo - the consciousness awakener - that will have a deep impact in the collective, helping them in the process of self-liberation. As we are all unique and we all are in different phases, within our evolutionary journey, this Eclipse's frequencies will offer us many opportunities for us to work with what specifically we desire to shift. For the ones who are working on trusting their own guidance and sharing with the world who they truly are and their unique gifts, this eclipse will offer them the gift of standing tall in who they are and finally get out of their protective cocoons to shine their unique spark of the Divine. Finally, for the ones who are already sovereign creators who have already done their inner work to become empowered and integrated beings. This eclipse will offer them the opportunity to become receptive channels and go further in their connection to other galactic companions who are there to show us the way to true self-mastery and unconditional love. As starseed souls and new earth seeds, one of our purposes is to bring information from our Unified Self and/or from other dimensions to assist All - apart from our own growth. Change is only unexpected when we are not yet acting as conscious and sovereign beings of our own human experience, giving our power to other people or forces to rule our lives. When we are conscious of the path that we created for ourselves, then we are the ones triggering this change - aligning with the frequencies that will serve us to anchor this transformation into the physical. It is not usual that I receive numbers or further guidance to share for All, as we are all unique, and I tend to receive it for myself and own expansion/healing process. However, this time my Unified Self shared certain numbers and crystals for the ones who are guided to align with this Eclipse's and resonate with what I received. Last number: 8, is the one connected to the infinite love of the cosmic heart as well as to our physical realm - bringing abundance, and the perfect frequency we need to bring our soul desires and visions in our human plane, where we reside and where we can only enjoy our creations and dreams. Three rose quartzs, surrounding the Tetrahedron, or chosen crystal, in the form of a triangle, if you do not have rose quartz it can also be ruby, pink calcite, and any other one that most resonate with you. Five black spinel crystals, and from here we continue creating the grid giving it the form of a spiral. And if you do not have spinel crystals you can also use cat's eye, tiger's eye, or any similar one. Lastly, eight jaspers (green ones) crystals or you can also use mica, opal, coral, citrine and any other one that you are more guided to work with. You can also mix the crystals and interlaced them with small ones, if you desire. Your soul will guide you towards the perfect grid creation for you and your unique purpose. Remember to make your declaration of protection before beginning with your grid, clear your physical and non-physical bodies, as well as sacred space and crystals, asking them to co-create with you (I find the word program a bit harsh) - honoring them as they honor your soul desires. There is no excuse, or fake cover to lie to these Forces, for we are deeply felt by this Wise Universe and where there is unlove, ego and lower energies, these Forces are immediately repel, by our own selves. In the moment we decide to open our hearts to all - what we think damages us, to what empowers us and to what we love - is the moment we begin to open the walls we built based on egoic interpretations. In that moment is when our connection to All That Is and has ever existed, begins, not because it was forbidden in this human plane, but because we did not recognize this equal and unconditional love for All.